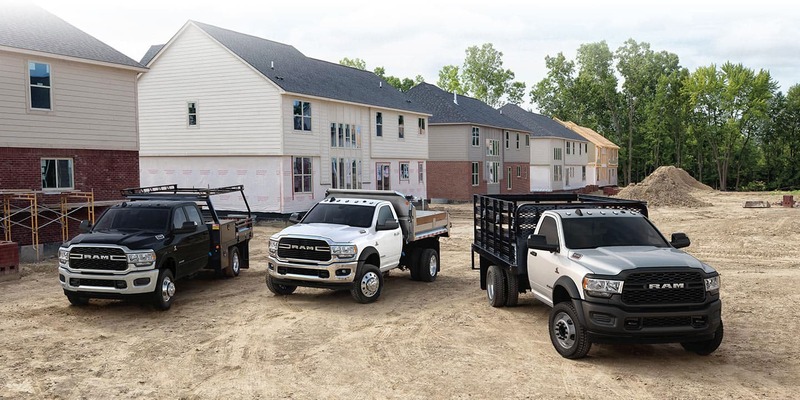 Ram has done it again, completely remodeling the 2019 Heavy Duty Chassis Cab for the 2019 model year! The Chassis Cab now offers more upfit capabilities and possibilities than ever before so you take on the big jobs with ease. If this truck will act as your office on wheels, rejoice because your workspace just got an upgrade from comfort to technology and everything in between. You can also stay focused on the job at hand with advanced safety technology that you can rely on to have your back no matter what. We have all the latest information about the 2019 Ram HD Chassis Cab so keep reading to learn more! The Ram HD Chassis Cab is available in three variations, 3500/4500/5550, and four trim levels. They include the Tradesman, SLT, Laramie, and the Limited. Class-leading comfort, durability, and quality are found with all trims thanks to the premium materials and all-new features. You are going to love the available 12-inch fully-configurable touchscreen interface with Ram tailor-made graphics that will let you use two apps at the same time! There are also four audio systems available including the remarkable Harman Kardon audio system with a total of 17-speakers! Driver information, like transmission temperature and boost pressure, is found with the 3.5" or7" electronic-configurable color driver info cluster display. The enhanced-ergonomic switch bank now offers up to five auxiliary switches and push buttons! A redesigned rotary e-shifter dial and push-button start are standard across the trims! Can you tell me about the powertrain options? The power behind the 2019 Ram HD Chassis Cab is undeniable! The standard engine is the potent and proven 6.4L Hemi V8 that pushes out 410 horsepower and 429 pound-feet of torque. This engine is mated to an eight-speed automatic transmission for smooth shifting. A six-speed automatic transmission is available. Under the hood of the 4500 and 5550 variations, this engine creates 370 hp and 429 pound-feet of torque. For more power, a revised Cummins 6.7L inline-6 turbodiesel engine is available. Paired with an automatic six-speed transmission, this engine delivers 360 hp and 800 pound-feet of torque. Getting the big jobs done is a breeze thanks to the incredible 35,220 pounds towing capacity (with the diesel engine). Load up the bed with all your cargo and materials and never worry about over packing because the Chassis Cab can handle loads up to 12,510 pounds! Allowing you to focus on the job, the Ram HD Chassis Cab offers an array of passive and active safety features. In fact, its the only truck in the segment to do so! All trim levels are outfitted with Automatic Emergency Braking, Automatic Emergency Braking with trailer brakes, Forward Collision Warning, and Adaptive Cruise Control. The class-exclusive ParkSense Park Assist system delivers both audible and visual indications helping you navigate work sites and parking lots. Another class-exclusive feature, the 270-degree camera system offers trailer reverse guidance giving drivers a greater field of vision. This truck can also monitor the air pressure of up to six tires on the truck itself and up to 12 tires on a trailer! 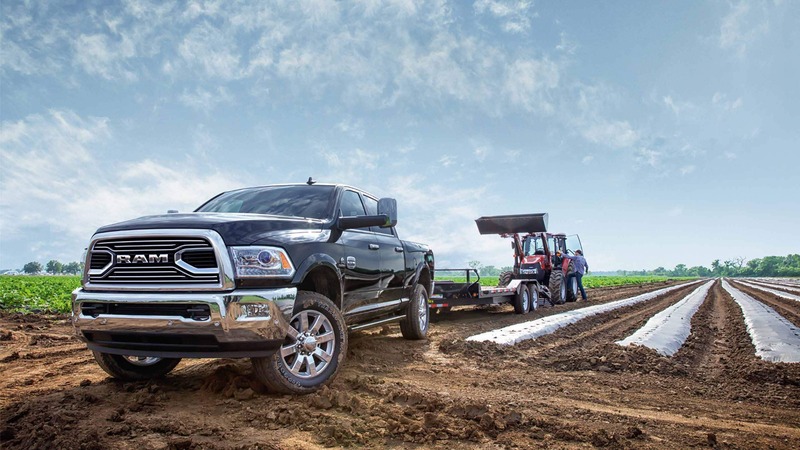 The 2019 Ram HD Chassis Cab is a truck ready to get it done. Incredible powertrain options, an array of safety features you can count on and all the latest tech make this truck unbeatable. If you are interested in learning more about what this lineup can bring to your business swing by the dealership today. Our sales associates are ready to answer any questions you may have and show you are around the truck!